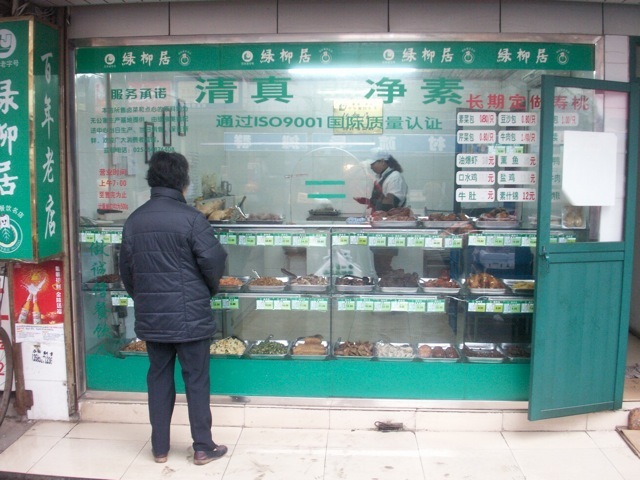 While riding in a taxi in Nanjing a few years ago, I saw a store with many customers waiting in line. After the taxi came to a screeching stop, I joined the line and found what the store was selling. It was a store with three machines roasting chestnuts, and the neighbors apparently love them and were willing to wait patiently for their quota of freshly roasted chestnuts. I ate mine after I got back to the hotel, and they were really good. 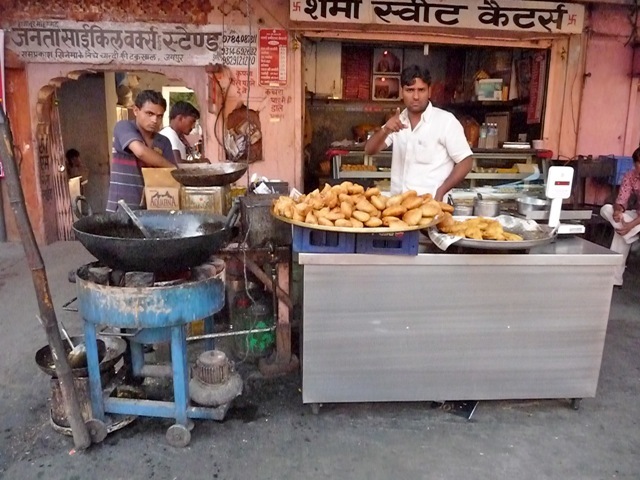 This demonstrates one cardinal truth in traveling: Eat where the locals love to eat. 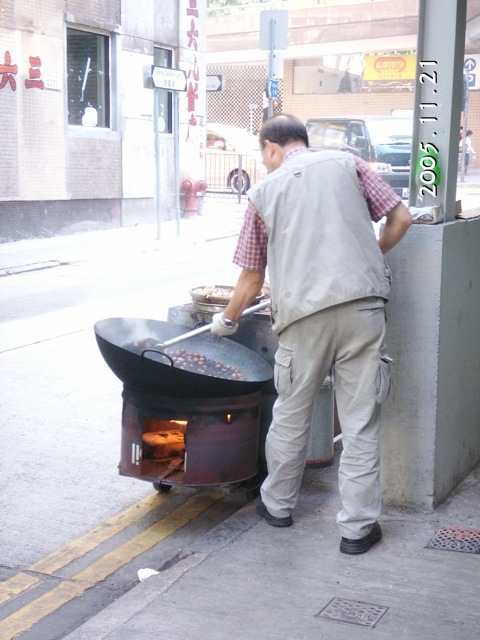 Back in Hong Kong, I could not find machine roasted chestnuts. The closest I found was this street hawker “chowing” the nuts in sugar coated pebbles. These chestnuts were warm and delicious in cold winter days. 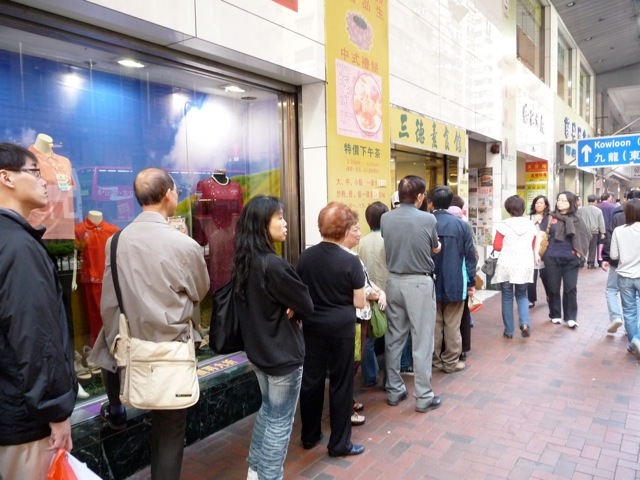 Lines of salivating customers form outside some Hong Kong eateries. Once a week, I rode the subway to this restaurant and waited in line for a seat, sharing a table with other appreciative customers. This restaurant basically sold only noodles in a rich, flavorful pork liver soup. 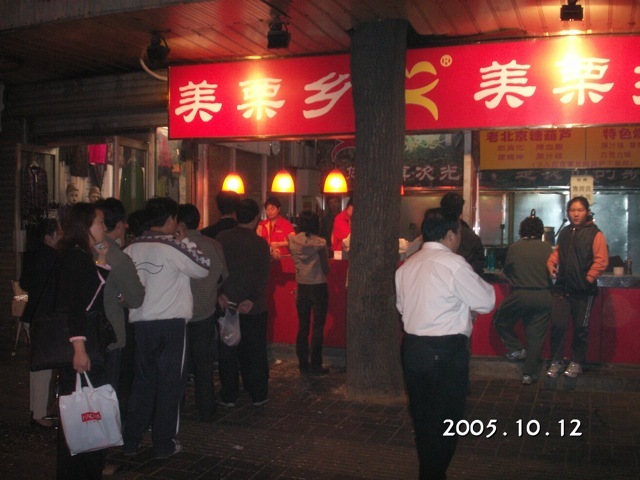 This restaurant started out as a hole-in-a-wall shop, but overwhelming demand forced it to open a branch, then another one. So we have the spectacle of three restaurants with the same name close to one another, and each with its line of waiting customers. 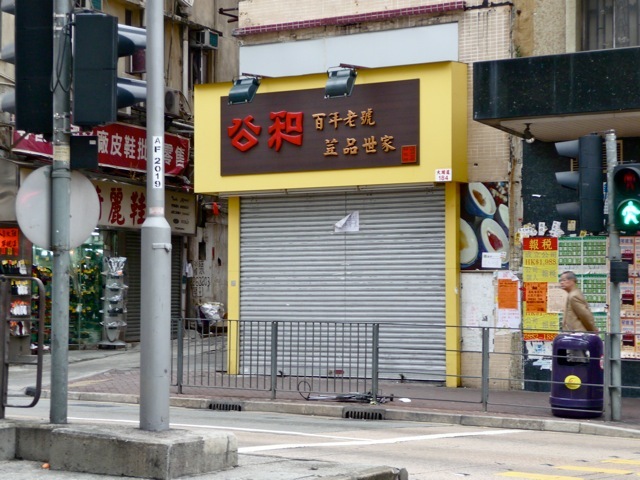 The name of this restaurant is Wai Kee Noodle Cafe on Fuk Wing Street in Sham Shui Po (維記, 深水埗, 福榮街及北河街). 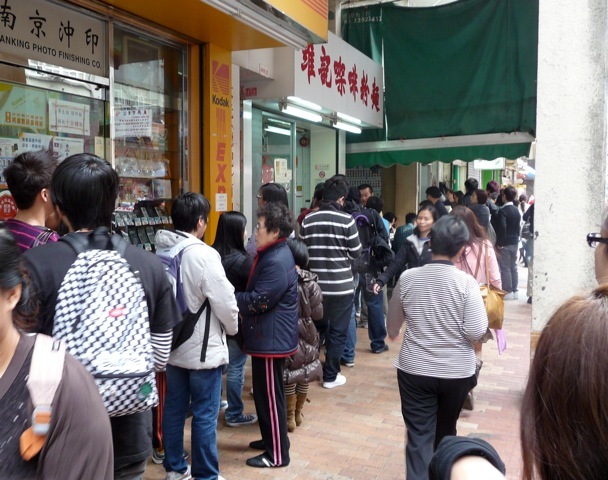 A long line forms near dinner time outside a small take-out store. They wait to buy vegetarian morsels at the take-out counter of a vegetarian restaurant. It is Three Virtues Vegetarian Restaurant in North Point (三德素食館, 北角, 英皇道). The vegetarian morsels are made from tofu, gluten, flour, and other vegetarian ingredients and flavored into tasty dishes. Sometimes they mimic roast pork, duck meat or sausages. This demonstrates a bit of hypocracy that while Chinese vegetarians don’t eat meat, their minds wish to eat meat. Here, I hold my long awaited favorite vegetarian mixed cuts 素鹵味. Sally and I found this restaurant’s food to be much more delicious and fresh than others, and they are not greasy like the others. Once a week, I rode public transportation for an hour to eat my comfort food: Tofu custard (豆腐花) and fried stuffed tofu bubbles (煎釀豆腐泡). I used to bring my own container of maple syrup to flavor my tofu custard, but eventually found the brown sugar sufficiently flavorful and ceased the trouble. The eatery was a tofu manufacturer turned store that also sold prepared food. Its dated decor has not changed since 1950s, nor has its higher areas been cleaned since 1950s. It is still decorated with the founder’s photo, defunct business certificate, and antique telephone. 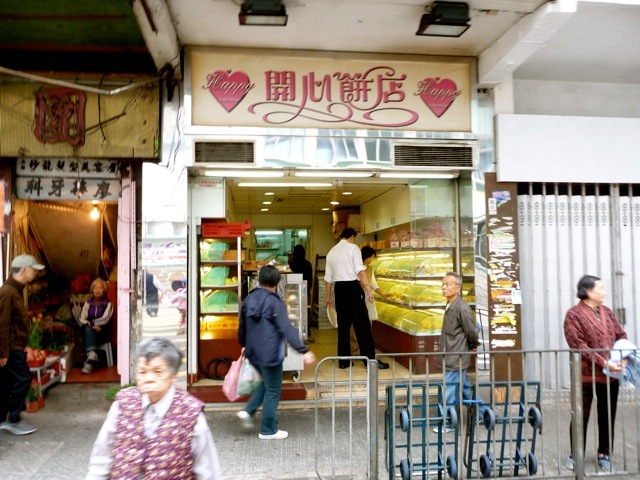 It is the Kung Wo on Pei Ho Street in Sham Shui Po (公和豆品廠, 深水埗, 北河街). I was thrilled when I saw a new restaurant with the same name and even identical logo of the old tofu store only a few blocks away. 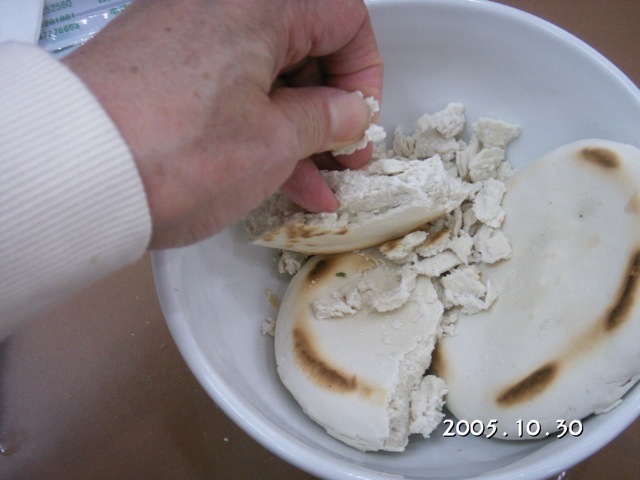 I ate there and found the food and tofu much less appetizing than the old store. I asked the old store and they assured me that they did not open a branch. I was happy to see the impostor restaurant close down after a few months. Its unscrupulous owner cheated the original store and us customers and was punished by the market forces. 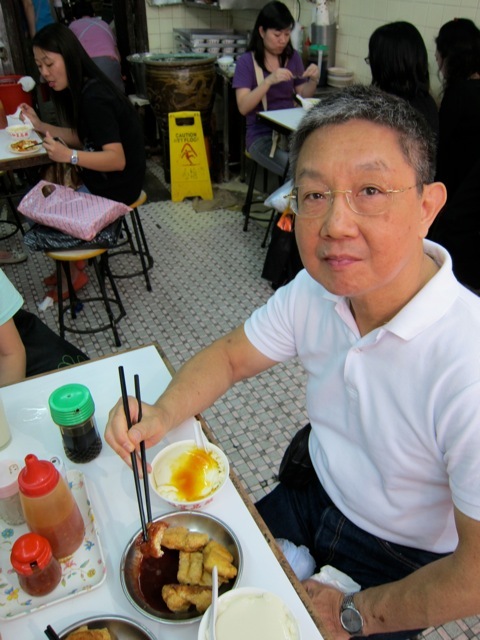 One delicious food from my childhood is a sugar coated, very eggy fluffy donut called “sandy old man” (沙翁, sar yong). It is reputedly originated in Guangdong, and its sugar covered appearance looks like an old man with white hair, thus the Chinese name. 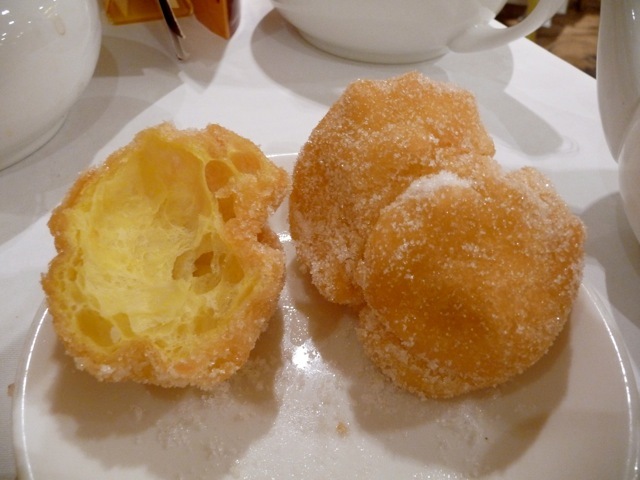 The closest thing to it is the French cruller made by Dunken Donuts stores, if they are only more eggy. I spent a year looking for the best sar yong in Hong Kong and found most to be simply western donuts without the rich, intense egg flavor. I finally found the best in an old bakery and I went there to buy two every week. 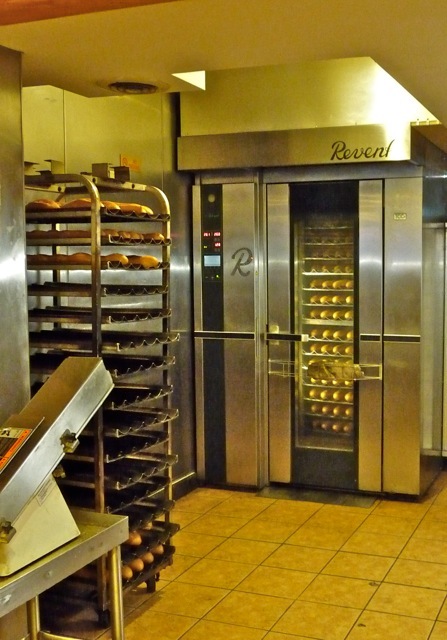 It is an old bakery in a poorer neighborhood, and it keeps making pastries the old way. Their sar yong are usually sold out by noon, so I had to call to reserve two for later pickup. 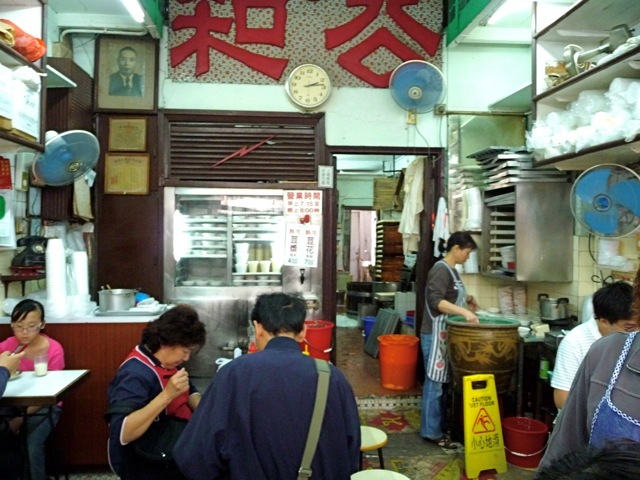 It is located on Nam Cheong St near Berwick St (開心餅店, 深水埗, 南昌街近巴域街). Sally and I found a simple but extremely well made snack. It is a toasted bun with soft inside but crusty skin, buttered and covered with condensed milk. It is best eaten immediately from the kitchen before it cools. 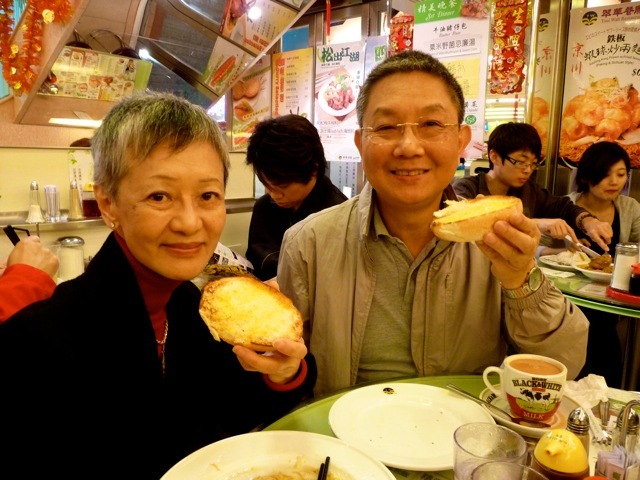 This common bun 豬仔飽 is the best at Tsui Wah Restaurant (翠華餐廳) chain with 16 shops in Hong Kong. 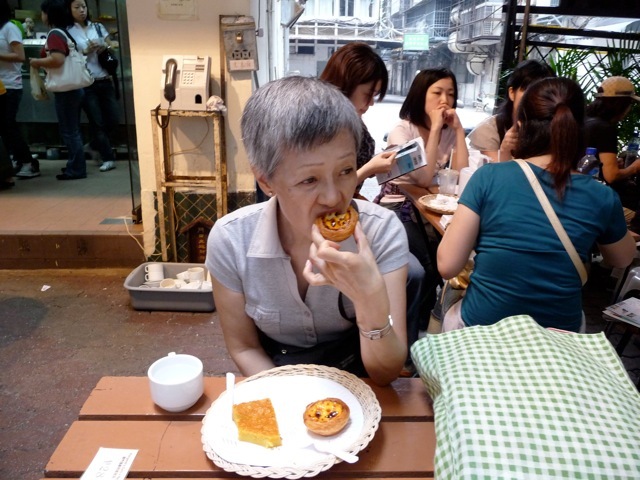 When in Macau, we always ate the “Portuguese egg tart” 葡撻. 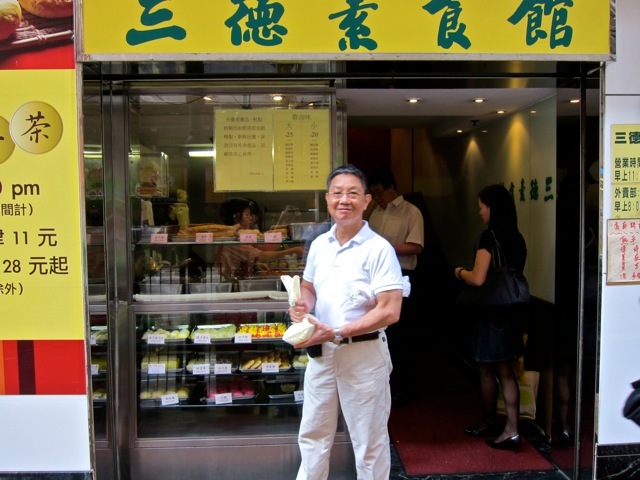 Our favorite is Cafe e Nata Margaret’s 瑪嘉烈蛋撻店 located at Edificio Kam Loi, Macau (澳門, 新馬路, 馬統領街). 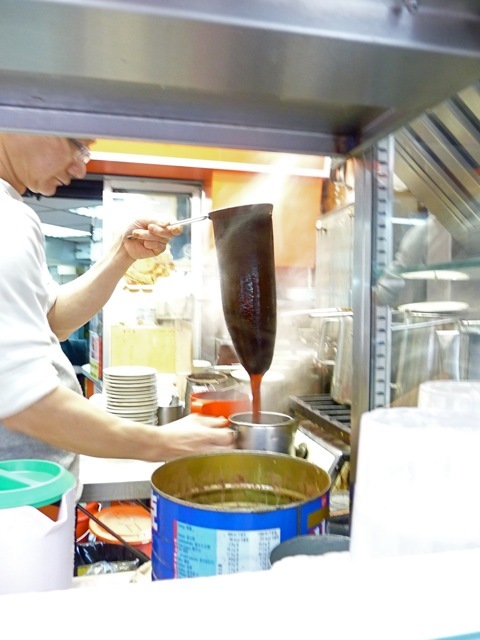 The famous milk tea of Hong Kong was adopted from the English colonialists’ afternoon tea. The HK milk tea is made very strong with propriatary blends and flavored with condensed milk. I make a fairly good milk tea with many Lipton tea bags boiled for 20 minutes. 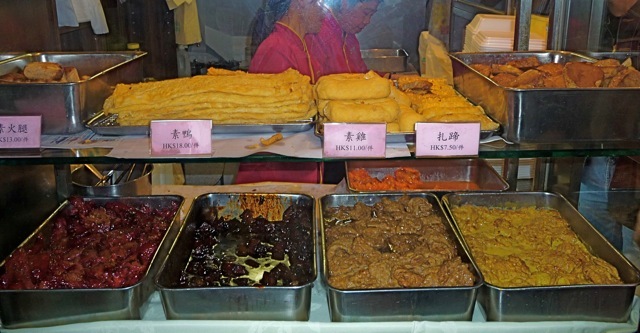 Almost all Chinese food in China are delicious. One really outstanding food we ate was the braised ham hock 萬三蹄 made in Zhou Zhong 周莊 near Shanghai. These ham hocks were ready to be vacuum packed and brought home by tourists. We chose to eat it fresh in a small restaurant by the canal. Sally was ecstatic with its wonderful taste. 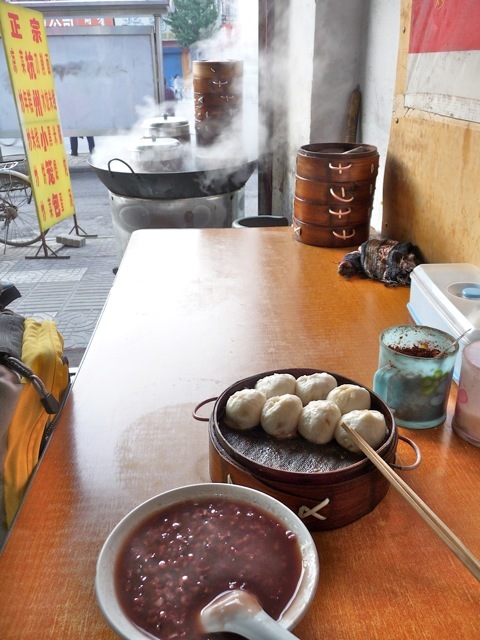 When I walked the Great Wall in Shanxi 山西, I started each day with a breakfast of porridge and a basketful of freshly made, delicious steamed pork buns. This empowering breakfast costed me 30 US cents only. 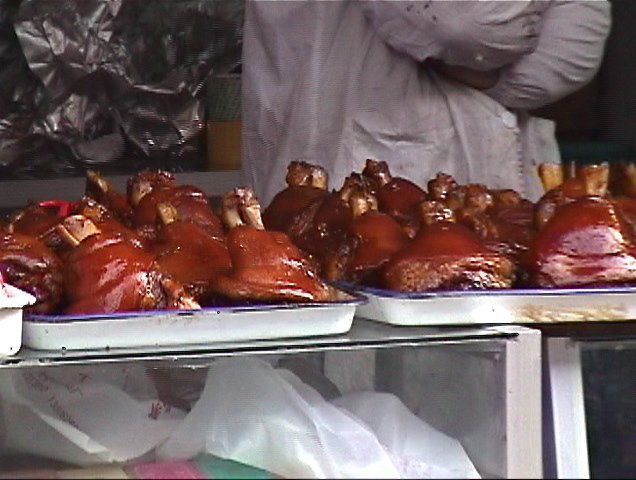 One of the most demanding Chinese food I ever had was in the Muslim district of Xi’an 西安. I was given two hard, dense, doughy buns. I had to spend 10 minutes to break the hard bun into bits with my fingers before pouring a rich lamb soup over the bits. My fingers ached for a week. I was most impressed with this Muslim cooked food stall in a Nanjing market that was otherwise messy and dirty. This cooked food store was scrubbed clean from the ceiling to the floor, and I would not hesitate eating anything they sold. We found delicious food in some of the most unexpected places. On our long bus trip into Tibet, the bus stopped at a lonely restaurant by the highway. We were served piping hot bowls of noodle and mutton. By Sally’s expression, it was delicious. Ming Pao 明報 had a columnist named 一條小百葉 who was a strip teaser in Japan before she moved to Hong Kong and learned the Chinese language. 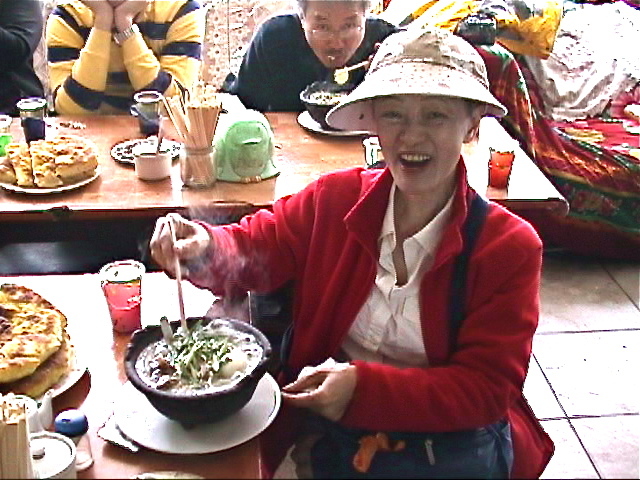 She selected applicants, went to their homes, and cooked Japanese food to appear in her column. 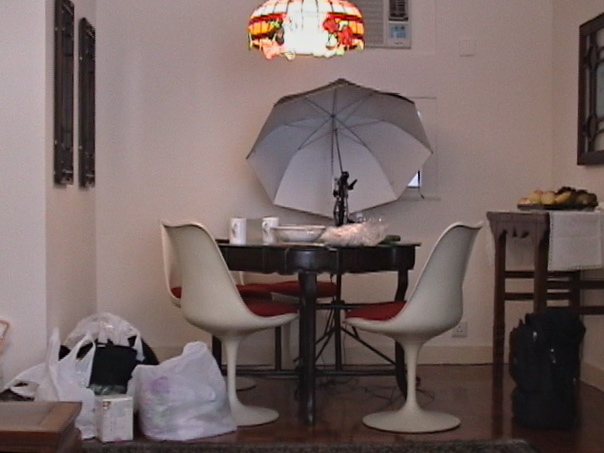 We were chosen and our dining table was set up for photo op with the cooked food. We hoped her strip tease was better than her cooking. 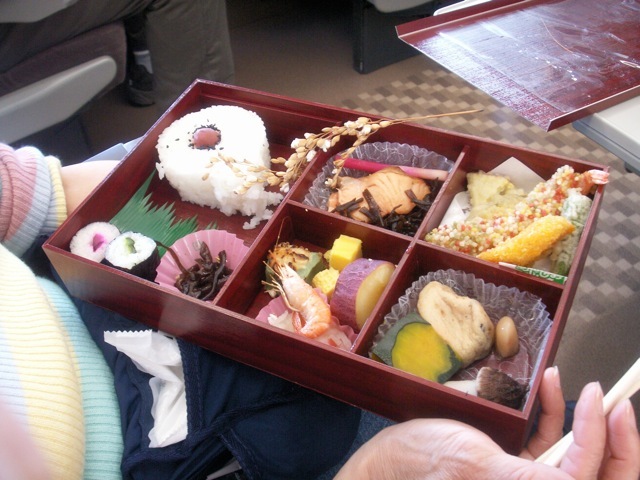 When riding on the bullet train in Japan, Sally treated herself to a beautifully-made US$20 bento box. She loved it. 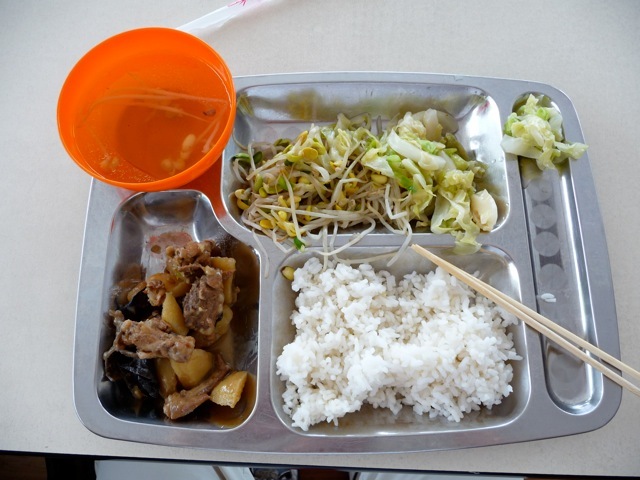 Traveling by bus in China, highway stopover cafeteria served very simple and barely edible food. I wow Sally once in awhile by cooking a meal. 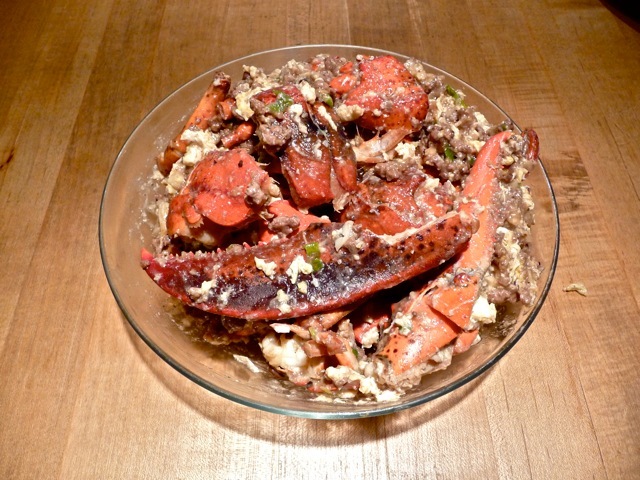 One of my best dishes is lobster Cantonese 廣東炒龍蝦, or shrimp with lobster sauce 蝦龍糊. This manner of cooking lobster was popular in US Chinese restaurants 30 years ago, but is forgotten as simpler Hong Kong styles prevail. If you want to have my recipe for this delicious dish, write me and I will send you my recipe. 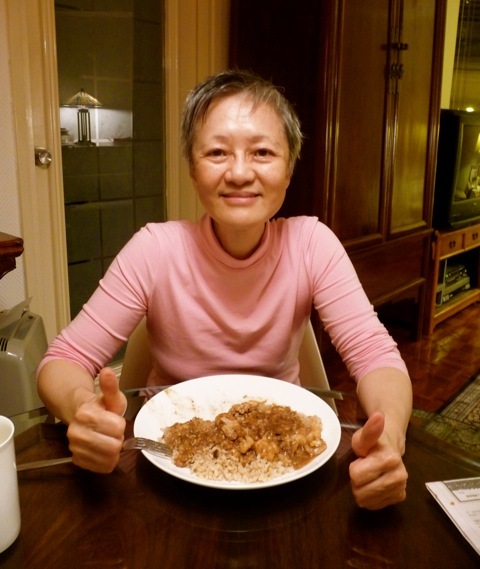 Sally gives two thumbs up for my shrimp with lobster sauce over rice. Hong Kong pizza taste nothing like US pizzas. They all lack some necessary flavor, spices or herbs. 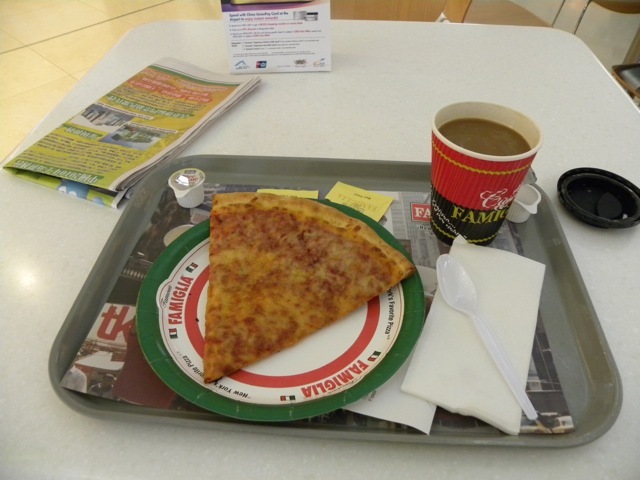 The only place in Hong Kong where I found New York flavored pizza is at the Famiglia counter located in the SkyPlaza Terminal of the HK Airport. We discovered it on our way to Egypt. It may be far from the city center, but if you hunger for New York pizza, then the one hour train ride would be worth it. 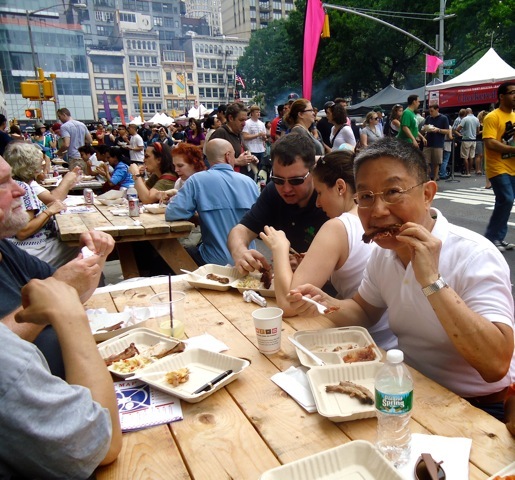 New York City has a BBQ festival once a year. BBQ vendors from all parts of the country set up shop and provide New Yorkers a taste of regional BBQ. 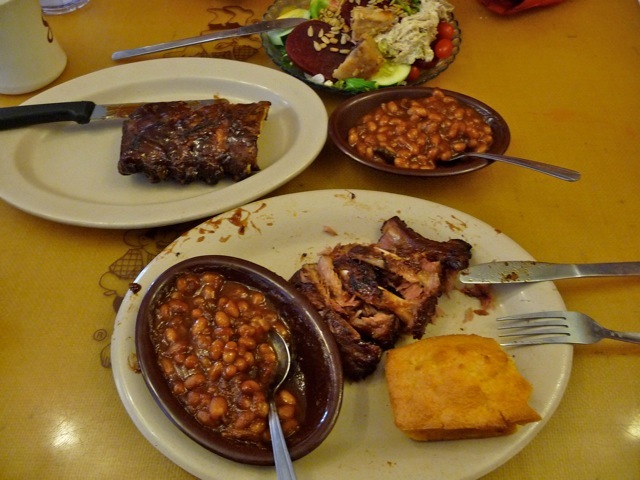 On our recent 3 week drive from NY to San Francisco, we ate at a dozen BBQ restaurants to try regional flavors. Many local favorites got only 2 or 3 stars from us. The surprise winner of our tasting project is the Sonny BBQ chain restaurant that are ubiquitous in southern and southwestern states. We ate at 3 of these Sonny restaurants and we gave them 5 stars. 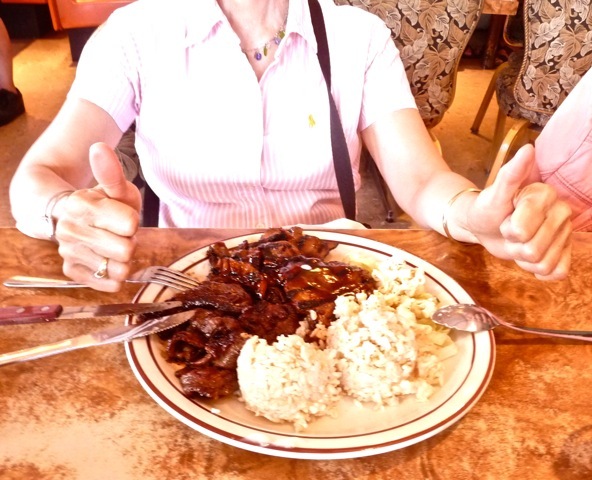 One surprise we encountered in Hawaii Island last month was Ken’s Restaurant in Hilo city. Its teriyaki chicken and beef were full bodied and flavorful, better than most Asian restaurant in NY and San Francisco. It deserved two thumbs up. We ate 2/3 of our meals for one week at Ken’s. When in New York, we eat New York style. At Carnegie Deli, this pastrami sandwich is excellent but obscenely thick. One such sandwich would feed me for a week. 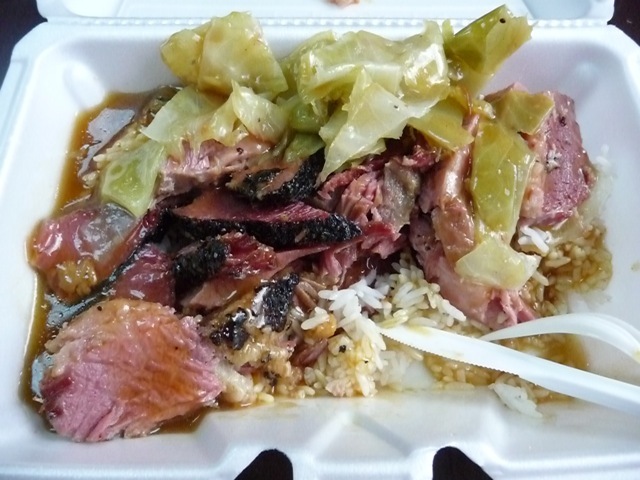 In a fusion of cuisines, a Chinese lunch counter serves pastrami and corned beef with rice and gravy. This combination is surprisingly good and warrants one visit a month by me. 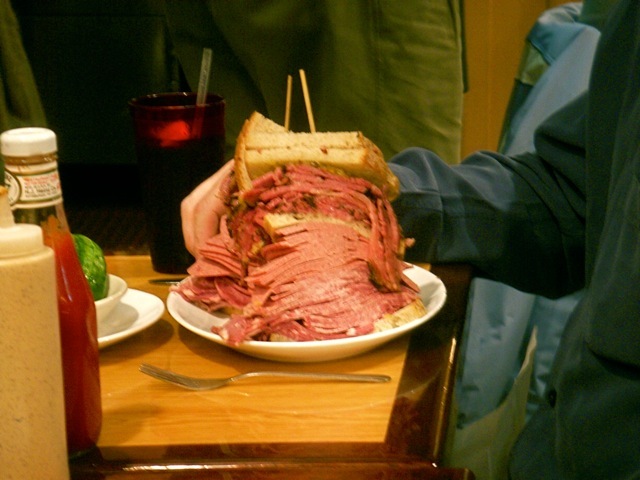 It is served at Sam’s Deli at 30 Mulberry Street in Chinatown. We have become fans of Vietnamese sandwiches, especially those filled with grilled pork. Our favorite is the Paris Vietnamese Sandwich on Mott St in Chinatown. It bakes its own baguettes in its own hot air oven. Those baguettes not sold in one hour are packed and sold at a discount. One bread we feel that rivals the baguette above was served in Egypt. 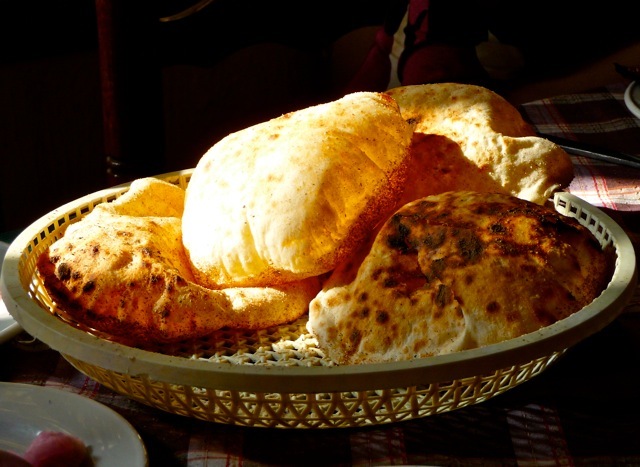 These bread were made on open oven and were puffy, thin and beautifully translucent under the sun. 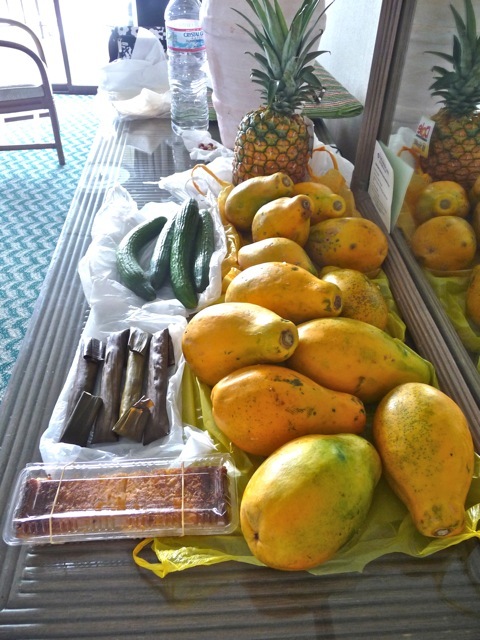 When we stayed in Hawaii Island for one week, we bought lots of fruits at farmers’ market. We bought 12 rainbow and strawberry papayas for $4. In San Francisco, we would have to pay $40. These Hawaiian papayas were sweet and had a distinguished flagrance. Even Mexico, which produces plenty of papayas, considers Hawaiian papayas as a premium fruit. 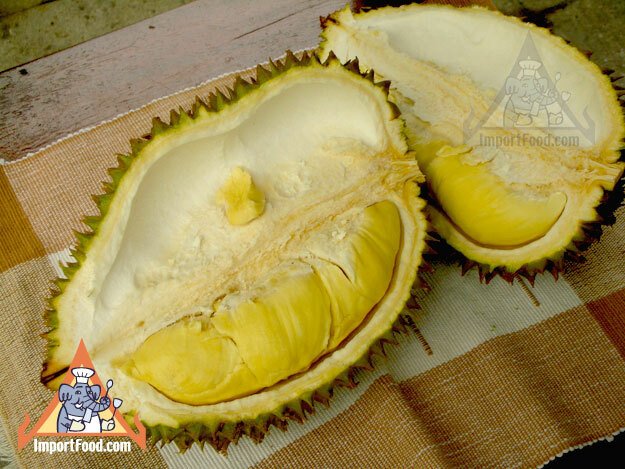 We did not find durians at Hawaiian farmers’ market. If we did, it would have been a perfect shopping trip. 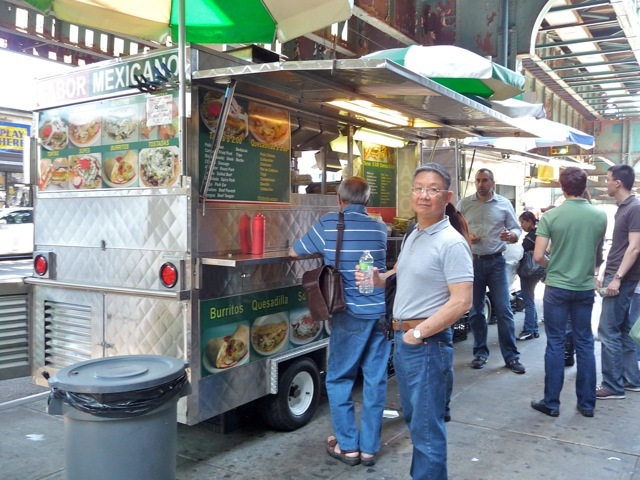 In New York, I rode subway for 30 minutes once a week to this taco truck under the 74th Street station on #7 line. Its $2 pork taco is delicious, especially made by the woman. If a man is behind the grill pan, I would avoid the truck and eat somewhere else. I took many pictures of food and people preparing and eating food. Once in awhile, people object to being photographed. If looks can kill, these Indian guys would have had my head. I took risks collecting information in this article. I hope you would patronize them and share with me your opinion of my comfort food. Posted by Robert Wu on Sunday, July 10, 2011, at 1:13 am. Filed under Uncategorized. Follow any responses to this post with its comments RSS feed. You can post a comment or trackback from your blog.